This is the probably the plight of thousands of citizens every year. People are asking for a more gentle and natural solution to the flu shot and for flu itself. Homeopathy is a holistic alternative and complementary system of healing that is based of the laws of nature. Homeopaths understand that symptoms of disease are evidence of the body’s natural immune system’s response to healing itself and these clues are used to guide them when prescribing a remedy. A homeopathic remedy acts as a signal which energizes or stimulates the body’s healing power, mobilizing the defense systems and working in the mental, emotional and physical aspects of the being. Gelsemium: Visualise the ordinary, typical influenza case, probably developing over six to eight hours. The patient feels a little out of sorts the day before, possibly a little headache, a little feverish, has a little indefinite pain, is probably a little catarrhal; he goes to bed, does not sleep awfully well, and next morning feels rotten. He is very dull and tired, looks heavy and is heavy-eyed and sleepy. There is a feeling of intense throbbing pain in the back of the head, spreading down into the neck with a sensation of stiffness in the neck muscles. He is most comfortable when keeping perfectly still, propped up with pillows, so that the head is raised without the patient making any effort. With these headaches, he often complains of a sensation of dizziness, particularly on any movement. Typical Gelsemium patients, despite their sweatiness and dryness of mouth, are not usually very thirsty. The patient is definitely congested, the face slightly flushed; the skin generally is a little dusky, and the surface is definitely moist-hot and sticky. 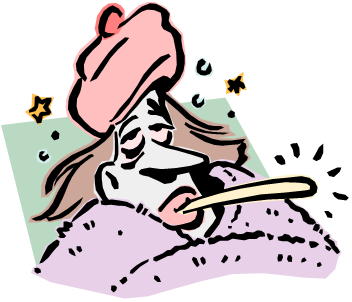 Bryonia: When the days are hot and the nights get chilly some of us tend to get respiratory or febrile illnesses. The typical Bryonia influenza develops, like the Gelsemium case, over a period of six to twelve hours. They appear rather dull, heavy, slightly congested, with a puffy face, yet they do not have the sleepy appearance that you find in Gelsemium. They have a good deal of generalized, aching pain and it hurts them to move. They feel hot, and are uncomfortable in a hot stuffy atmosphere; they like cool air about them. They are always thirsty, and their desire is for cold drinks-large quantities of cold water. There is usually a thickly coated white tongue which is liable to become dirty or brownish in appearance. The headache is intense, congestive and throbbing- “bursting and splitting” mainly in the right forehead. This is very much worse from any exertion-talking, stooping or movement of any kind. They may also complain of constipation- the bowel movements are once in two or three days and the stools are dry, large and hard. Rhus tox: The onset of influenza is usually gradual and with out a very high temperature; it is a slowly progressing feverish attack, which is accompanied by very violent generalized aching. They are extremely restless; their only relief lies in constant movement, constant change of position (in contrast to Bryonia). If they lie still for any length of time, their muscles feel stiff and painful, and they turn and wriggle about in search of ease. There is usually a tendency to develop fever blisters around the lips and the mouth. While the back of the tongue is coated, the bright red triangular tip of the tongue is another pointer to the use of Rhus tox. The fever may be accompanied by hives or urticaria (nettle-rash) with severe itching and burning that is relieved by warm applications. Though they feel warm inside, they cannot tolerate the cold and are easily chilled. Eupatorium perfoliatum: The severe pains that accompany the fever point towards Eupatorium. They have severe bone-breaking pains in almost all the bones or a sensation as if the joints were dislocated. People needing Eupatorium are always chilly; they feel cold and shivery, are sensitive to any draft of air and very often have a sensation of chilliness spreading up the back. The sweat is scanty but when they do sweat it relieves all the complains except the headache. The cough is very violent, with scanty sputum, and it seems to hurt the patients from head to toe. It makes their head burst and increases the chest pains, so that they try to restrain the cough or control the chest movement even while they are coughing because of the pain. Ipecac: ‘Stomach-flu‘ often meets its match in Ipecac. The person has been unwell the previous day, off the food or may actually have vomited. Ipecac is more commonly indicated in the milder weather than in the intensely cold weather. There is a persistent nausea which is not relieved by vomiting. However the tongue is usually clean or only slightly coated. There is absolutely no thirst even if the temperature may rise to 103 F. There might be an associated cough which is very moist. The chest seems to be full of phlegm, but not much is brought out on coughing. Homeopathy also has many remedies that can be given as prophylactics for influenza. Disclaimer: It is not advisable to resort to self-medication for any disease. The above mentioned drugs are just a few of the remedies and are mentioned solely to create awareness about the efficacy of homeopathic medicines in ‘flu’.